As the sign reads, this is The Big Badlands! 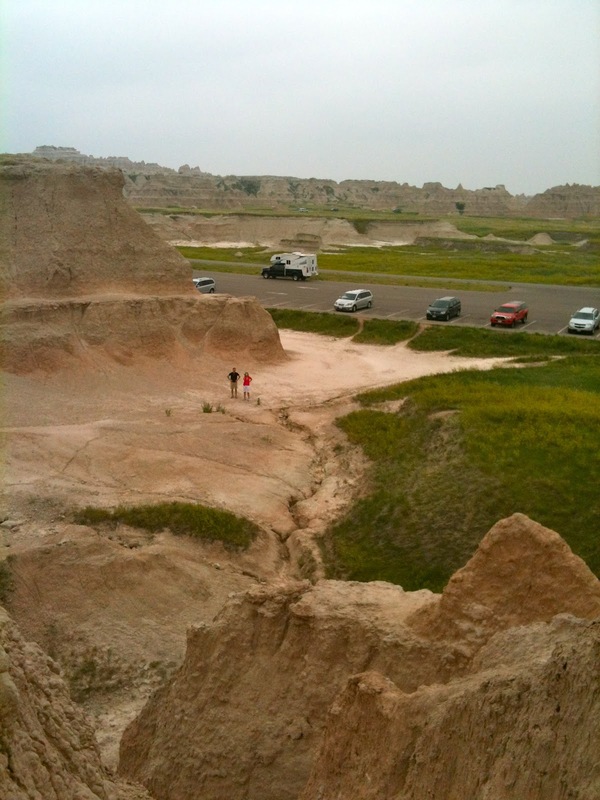 After driving across South Dakota the day before, we finally arrived at one of our big stops, Badlands National Park. It was like nothing we had ever seen, or at least my husband and kids had ever seen, I came here as a child. 🙂 It is hard to describe a landscape that doesn’t really compare to anything else. It kind of reminds me of the Grand Canyon, except that it is so spread out. It also makes me think of the Napali Coast in Hawaii. But while it has the same shapes as the Napali Coast, Hawaii is lush and tropical, which the Badlands clearly are not! 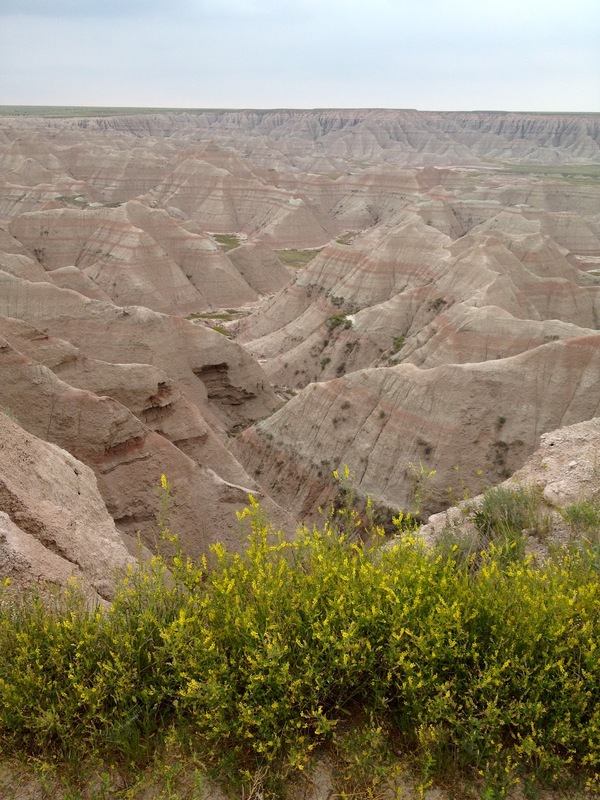 I think the Badlands are best described in pictures. Then you can decide what they might compare to. One thing is for sure, if you have small children you better stay on the pathways or hold their hands. My kids scared me to death getting WAY to close to the edge for my liking! I, on the other hand, did not heed my own advise and took this video for you. I swear it didn’t seem as scary taking it as it does watching it. There are numerous stops along Highway 240, also known as The Badlands Loop, to get out of the car and explore. It is really up to you on how much exploring you want to do. You could make a few minute stop where you only walk to the end of the pathway, turn around and head back to the car. Or you could hike for miles. Be smart about that one though…carry water & any other supplies you might need. Oh, and watch out for rattlesnakes! There were many signs posted about that. I overheard some pretty funny stories of Moms telling their little ones about the snakes. 🙂 Only a few of the stops have restrooms, and as you can see from the pictures below, you don’t want to be stuck out there if you need to go. So plan wisely! This is actually a marked path (see the yellow post?) to a great look-out point. I wouldn’t do it with little kids or if you don’t get around so good yourself. But I did love how you could create the experience YOU wanted. As you can see, it wasn’t crowded at all. After all our exploring, we were hungry. So we headed to the Ben Reifel Visitor Center and Cedar Pass Lodge for lunch in the full service restaurant. This is the ONLY place to eat in the entire park, unless you bring your own food. It took a little longer than we would have liked, but the food was descent and it took care of the grumbly tummies that we all had. I had the Sioux Indian Taco made from their special fry bread and seasoned buffalo meat and then I was ready for more exploring! This time our exploring took on new heights as we climbed up on the formations. 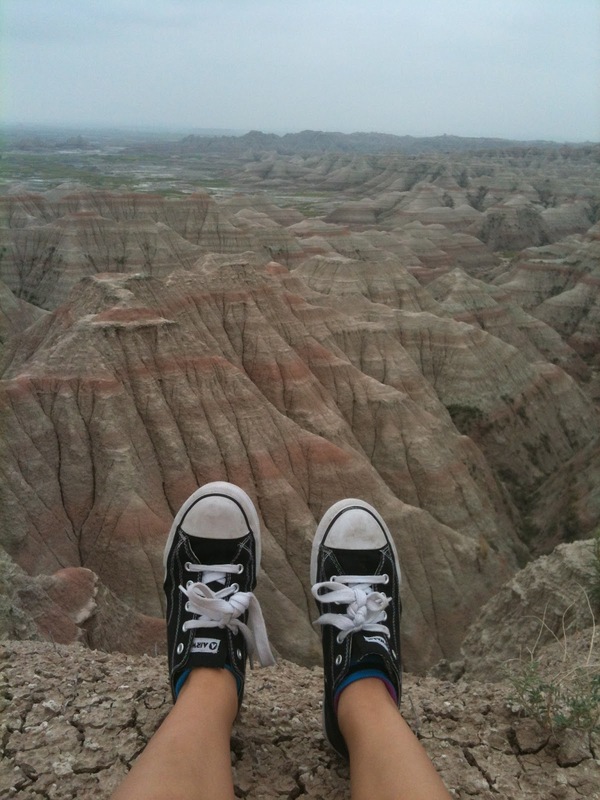 One of my favorite shots of the kids in The Badlands! Looking back at the parking lot and myself…that’s strange, my son must have taken this one. Looks as vast and spectacular as the Grand Canyon! Are the Badlands covered in snow in the winter? That must be stunning too! They are and it is beautiful, but you actually loose some of the details. Would that be where they used to film all those old cowboy films? It looks strangely familiar but I don't think I've actually heard of this place before. Thanks for sharing! I think they did film some of those here. It looks really amazing in person.